Well done, good and trustworthy slave; you have been trustworthy in a few things, I will put you in charge of many things; enter into the joy of your master (v.21). Over the last couples of weeks our readings have assumed darker tones and, as we move towards the solemnity of Christ the King, they have gradually moved our attention towards the end of times. Last week Jesus told us the parable of the wise and foolish bridesmaids, teaching us to keep watch for his arrival aided by the lamp of prayer. Today Jesus presents us with the parable of the talents, teaching us how to behave and act as we await for his return. God is the master, the man going on a journey, and we are the slaves. The talents are the wealth and riches we each receive from God. The trading with bankers is our own stewarding of the riches – though a particular kind of stewarding which requires us to give freely and generously; in other words, giving to charity. The interests accrued are the fruits of our charitable giving, fruits that will win us the praise of our master, and a share in his joy. 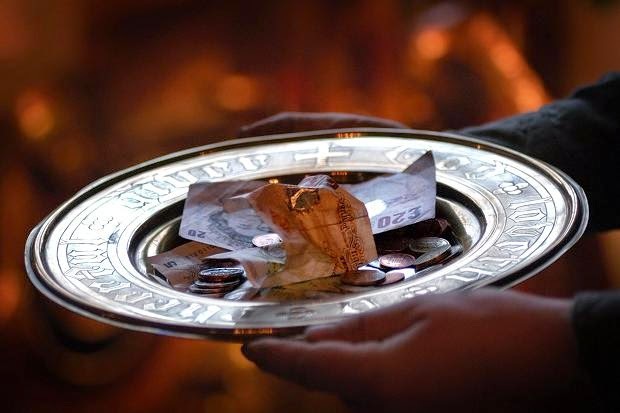 I remember that as a child when I went to church I was encouraged to put some money in the collection at Mass. But how could I do that? you might ask, I was only a child and pocket money wasn’t a source of reliable income. Well, as the plate made its way towards my seat, my parents would put a banknote in my hand so that I may have something to give. To this day, when I go home, and I am about to leave for church I am usually asked if I have Euros to put in the collection – you never know, I might have only foreign coins in my pocket. A that time I felt that my giving was a bit like cheating God – at the end of the day I was offering to him something that wasn’t really mine to start with. And yet, later on in life I came to understand that God works with us a bit like my parents did with me. He provides us with life and riches so that we might have something to offer him. The parable of the talents teaches us the correct attitude to giving, to sharing the riches we receive. Christian giving implies two aspects; first, we must become aware that all the talents, time, and any wealth that God has bestowed on us are not ours, they are not our possessions but they are still God’s. Secondly, Christian giving means stewarding what we have received for the glory of God. He is the giver and provider of all good things who entrusts us with his abundant riches so that his love may be shown to others through our free and generous giving of time, skills, and yes, also money. We receive things for a season, and then we must render a detailed account of our investments. The coming weeks and months will present serious financial challenges for our church. As some of you will already know the diocese has decided to increase significantly the common fund contribution that each parish ought to make towards our mission. There will be chances from scrutiny and assessment about what kind of mission the diocese would like us to embark on, but this is not that time. This is a time for us to look at investing the riches entrusted to us by God; it is the time to review our giving and to be ever more generous. In spending what we have received for the benefit of God’s Church and the advancement of his kingdom, we will reap generous rewards from him. What seems to make us poorer in a monetary sense will allow us to hear the words Well done, good and trustworthy slave; …enter into the joy of your master (v.21). I know all too well that little voice in our heads that says, “But others have more, they can afford to give more.” Yes, in some cases that may be true and I don’t want to open windows of peoples wallets – as it were. I, for myself have to look at my own stewardship of God’s abundant gifs. I just want you to look at the example that Jesus gives us in the two trustworthy slaves; He says of the first slave, The one who had received the five talents went off at once and traded (v.16); and of the second he says that he acted In the same way (v.17). The two trustworthy slaves don’t lose time gossiping, looking at others bank accounts in envy or resentments, they just do at once what the master ordered them to do. Teach us to serve you as you deserve.